Alan Couzens: Time for a lactate test? • Determining ‘weak points’ that we can use to direct future training. 1. Establishing individual training zones. The notion of using ‘zones’ to direct training has become a bit of a contentious topic of late, with some coaches asserting that the delineation of metabolic processes into zones is arbitrary and an over-simplification of the way our energy systems work together. While I would agree that the ‘90s saw us getting to a point where the creation of zones got a bit out of hand (at one point the Australian Institute of Sport used 9 of them), there are a few critical physiological points that need to be determined in order for the training to be at all effective. The most significant of these is what we call the Aerobic Threshold. If you google this term you’ll see even more disagreement and confusion – Does this point consistently show up on a lactate test? Does such a physiological entity even exist, blah blah blah. Discounting the definitional problems, the practical reality is that when conducting a lactate test from a sufficiently low level of intensity, lactate will remain at a relatively low plateau through increasing work stages until a certain point is reached when it begins to rise. We deem this point the ‘Aerobic Threshold’. The Aerobic Threshold has considerable practical significance as it represents the lowest intensity level at which aerobic energy supply is challenged. One might suggest that since aerobic energy demand is not challenged below this point that any training done significantly below this level will not disrupt homeostasis enough to elicit a training effect and is essentially a waste of training time. This has indeed been confirmed in studies that have looked at athletes who conducted very high volumes of training at low intensities (less than AeT). For example, 5.5hrs of ski touring a day for 8 weeks resulted in ZERO change in aerobic capacity of the muscle (Schantz et al. 1983). Therefore, knowing this point so that training can be directed at or above it is knowledge worth paying for! Similarly, knowing the high end of this range, i.e. 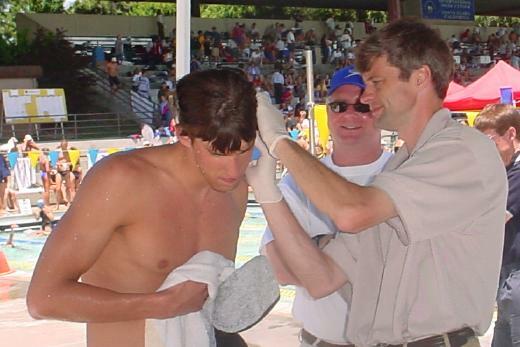 the point at which blood lactate and the associated exercise limiting by-products begin to ‘over-ride’ the system is very useful information in training and racing as it sets an upper cap of the intensity level at which you can accumulate a significant amount of work, work that is limited by the energy of the athlete rather than acidosis. 2. Establishing weak points to direct the training. I’ve talked before about the importance of directing the athletes training towards their physiological ‘weak points’ with respect to their event. My preferred way of determining these areas that are ripe for improvement is via the power-duration or ‘fatigue curve’. 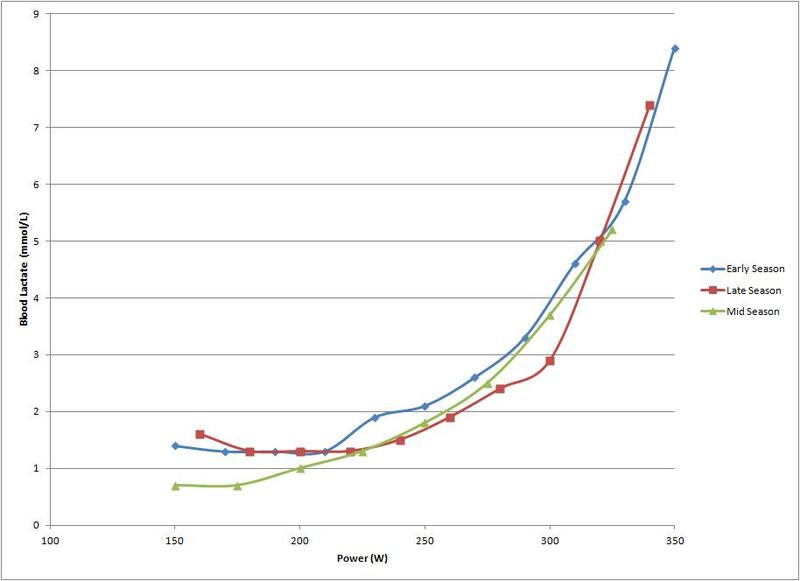 By looking at how power or pace drops off as duration increases, we are able to make some conclusions of just how strong the athlete’s fatigue resistance or endurance is when compared to their max power numbers. The downside of this ‘critical power’ testing is that in order to make conclusions about the far end of the curve, i.e. the endurance of the athlete’s energy stores, these energy stores must be tested (i.e. depleted). There are only so many times in a season that I want an athlete to put out a best effort test of 2.5hrs or more in duration. Therefore, getting enough data points to make any firm conclusion on the far end of the curve can be practically problematic. Fortunately, the lactate curve offers us a good proxy for the fatigue curve without the extended recovery that comes with assessing the far end of the curve. In the same way that the fatigue curve can be altered depending on the training undertaken, the shape of the lactate curve is also quite malleable and can literally be molded into a desired shape depending of the training intensity that is emphasized. A good example of this is shown below. 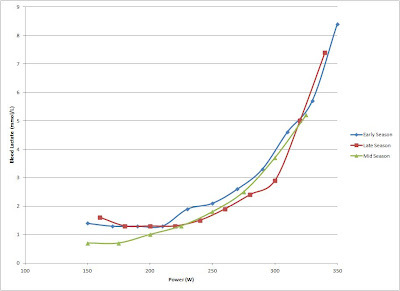 The above charts show 3 of my own lactate tests from different times in the year (times with different training emphases) and how the middle of the curve 'drops' as training is shifted. The ‘early season’ line is from March of this year, after 4 months emphasizing base training (at or below 210W – the top of my current ‘steady’ training zone. The ‘mid season’ line is from August of last year following a period of mixed intensity training culminating with a training camp. You can see a distinct drop in net lactate production in the middle of the curve (210-290W) following this training The ‘late season’ curve is from October of last year following a block of Ironman specific training. This training yielded the highest AeT point of the year at 240W before a significant rise in lactate occurred. Unsurprisingly, I was doing a lot of volume at race pace (200-240W) during that block. How does this relate to the standard fatigue curve? Based on what I’ve seen to date in comparing field & lab data of athletes, the % drop off in the lactate curve is ~2x the % drop off in the fatigue curve, i.e. a 20% lactate curve will equate to an ~10% fatigue curve in the field. I’ve said in the past that an elite IM fatigue curve is in the range of 5-6%, placing the lactate curve at 10-12%. 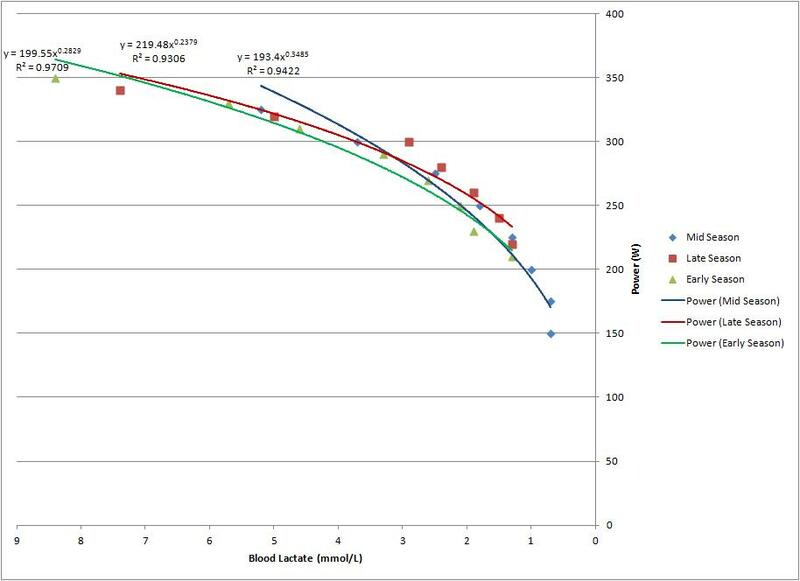 In practice, this may look something like 360W/8mmol 330W/4mmol 300W/2mmol 270W/1mmol, i.e approx 10% less power with each 50% decrease in lactate. This would be a typical pattern for a larger elite long course triathlete. On the flipside, an endurance athlete who requires great anaerobic capacity, e.g. 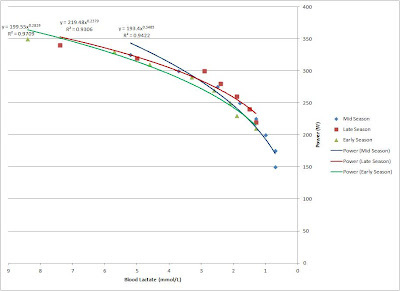 a road cyclist who specializes in the sprint will require a significantly different shaped curve with a much greater ability to generate lactate at high power levels, a curve closer to 20% (La max ~16mmol/L) In this case, the amount of aerobic vs anaerobic training that we want to undertake becomes a real consideration! This relationship between lab and field is not perfect (and is the reason that as the season goes on I move more and more to field testing centered around the demands of the race) but in terms of getting a quick, relatively painless big picture assessment of where you are with respect to the specific fitness demands of your event, lactate testing can be a very useful tool.